From 2004 till 2009 my biggest project was the Freeband AWARENESS project, a collaborative research project in which we worked on context-aware middleware for mobile applications, focusing on mobile health applications. In 2008 a journalist interviewed me for an article on telemedicine, to appear in a Microsoft internal magazine. I never got to read this article myself, but earlier this month, and two years after the interview …., it also appeared on a Dutch online magazine. 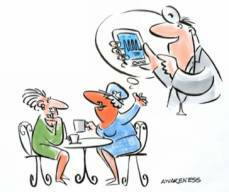 For those interested, and able to read Dutch: Telemedicine: the 24-uurs virtuele thuisdokter. This entry was posted on Wednesday, March 24th, 2010 at 22:27 and is filed under Uncategorized. You can follow any responses to this entry through the RSS 2.0 feed. You can leave a response, or trackback from your own site.